The 72nd Goodwood Members' Meeting was actually a brand new event, and there's nothing like it. Book your plane early for next March, Goodwood is just an hour from London and you'll never forget how they shake up the British countryside. Despite a very long Friday, I was at the Goodwood Circuit early the next morning as Lord March wanted to say a few words to the members of the press. As his guest, the least I could do was show up on time. But since he was running late, I filled my plate with bacon and what Jamie Oliver would call 'succulent British pork sausages,' sat outside and watched as people started to arrive at around 7:30. That's when the dark purple McLaren P1 rolled in. The youngest car inside the gates by a long shot. I was just about to finish my sausages when Lord March arrived. He is exactly how you would imagine a modern English aristocrat. Wearing Tweed and being in a jolly good mood for having a hobby no less rewarding than what his ancestors used to spend their fortunes on: motor racing. Thanks to the previous Earls of March, the Goodwood Estate has two world-class golf courses, one of the most beautiful horse tracks in the world and the Goodwood Circuit and Aerodrome, which was turned into a racetrack in 1948 after the RAF was done with the Nazis. Although Bruce McLaren died here during testing in 1970, the last Members' Race was held in 1966 since the British Automobile Racing Club didn't want to set up more chicanes than the brick one built in 1952 to reduce speed. Lord March on the other hand did modify the track to make it safer after the relaunch of the Festival of Speed in 1993 by replacing those bricks with Polyethylene, and the Goodwood Circuit was allowed once again to have five race days a year. Five days when noise regulations are out of the picture. The Revival has been held since 1998 and became so big that it's attracting 80,000 visitors daily takes out three days . The Festival of Speed is a hill climb outside the circuit, leaving Goodwood with two race days to spare. The members also got a bit fed up with the crowds, so something had to be done. Welcome to the Members' Meeting! There are about 5,000 members of the Goodwood Road Racing Club, and they can invite four people to the Meeting. My advice is to poke a lord on Facebook and get into the circle of trust, because you have to get a ticket next year somehow. This event is like nothing else on the planet, an absolute must see. Even without the cars, the Circuit provided a lot of entertainment. It was also stunning, as Lord March got some Dutch guy to plant 300,000 daffodils for the occasion in about four days, with a machine that's so cutting edge, even the Goodwood team was forbidden to take a photo of it. The big dining room was built to look like the one in Hogwarts, with long tables, candles and the shields of the four houses competing at Goodwood on the wall. There's no Quidditch here, but winning a race scores a hundred points, while those without a helmet can gain for their houses by being the best at towing, darts and other quintessentially British activities. Having a meal here was surreal enough without Sir Stirling Moss enjoying his wine at the next table. Outside, there was a barbecue on the lawn, another food tent build entirely of straw bales with a tractor in the middle, and those who wanted to enjoy the sunshine just had to grab a deck chair to enjoy the view from the top of the mound. The attention to details was evident, but than again, it had to be for the people who spent a lot of money on getting their cars here. Since the hangars are occupied, all the planes got rolled out to the grass, and at this point, let me tell you that they have a Spitfire as well. Oh, and a spare Rolls-Royce Merlin V12 engine in the lobby, just in case. Not only that, but Goodwood is also one of the few places where you can actually learn how to fly a Spitfire. But let's focus on other sort of wings for now. The thing about Goodwood is that there's no car they can't get. I asked them about it, and they tried to give me a humble answer, but after saying 'well, all the Silver Arrows were here', they had to agree that nothing is impossible. Still, as I walked around the paddocks, looking at a never before seen collection of priceless and historically significant machines, I didn't feel like an outsider at all. This wealth comes from the old days, the owners are passionate car lovers and the whole atmosphere of the place is extremely friendly with everybody being in good spirits as the sun shines through the sound of the exhausts. Because let me tell you that working on the cars and revving the engines didn't stop for a second during this long weekend. For the Members' Meeting, they had three sorts of course cars. Two fastback Mustangs (including a Bullitt replica) played tribute to the car's 50th anniversary, while an Aston Martin DB5 acted as a safety car and two Ferrari F40s were used as pace cars for the Low-drag Le Mans prototypes and the Turbo-era F1 demonstration. Their full power wasn't always needed on this rather short and fast track, but rumor has it that the McLaren P1 achieved 180 mph in the main straight. Bruce McLaren would have been surprised. The tin tops. If you want to see real motorsport, nothing beats classic touring cars. And these guys really pushed their machines as hard as it gets. With a Mini that was faster than a Camaro Z/28, Rover SD1s with a V8 louder than a Camaro's and the American spitting flames as it blasted through the field, there was a lot of action going on on both days. The Mazda RX7's screaming engine could only be compared to the legendary 787B Le Mans car's and while the Ford Capris were faster than any BMW or Alfa on the track, they seemed to be using more oil than petrol in the process. Witnessing this also made me wanna get a Triumph Dolomite Sprint badly, with a side pipe of course. Because Leyland! These mostly home-built classic formula cars were powered by rev-happy Fiat, Ford or BMC engines, and with the right driver and tune, they could punch way above their weight back in the day, with such names at the wheels as Jim Clark and Jochen Rindt. Now, almost six decades later these tiny racers looks just as home on the track as any modern Caterham would, although I had the most respect for their drivers going flat out while having zero safety features on their cars whatsoever apart from their helmets. It really was just like in 1958, and I believe only one car was crashed, but have no fear, a bit of fiberglass damage is easily mendable. What was most amazing about the Ferrari 250 'Breadvan' and its company apart from the fact of what they are is that these pretty much priceless race cars are full of battle scars once you got a close look at them. And that's the real beauty right there. Instead of being museum pieces or hidden in somebody's private collection, these glorious racers hit the tracks all over the world, and from now on, at the Members' Meeting too. What's it like to get a peek at the pinnacle of GT racing? Remarkable. Especially since they never stop, avoiding body contact lap after lap by only a few inches. If you can forget about their value for a second, you'll see that race cars were meant to do this, and the fact that their owners feel the same about them means that younger generations can witness such legends in action and learn that the weird Lotus 'Breadvan' is ridiculously fast. Let's make some noise, shall we? From the dealership straight to long distance races. Back in the fifties, that was. In 2014 at Goodwood, classics that would normally only see sunshine on the weekends got a number on their doors and the pedals pushed harder to the floor than usual. And they took it just fine, with only a few retirements throughout the event. Ferraris, Jaguars, Alfa Romeos, Triumphs, Lancias, Aston Martins, a Porsche and all sorts of other British makes showing the guests what a fun road car looks like on a fast circuit. Any of them would be welcome in my garage. One thing is for sure, I've never seen a Mini faster than the Cooper S that won this round. Than again, I didn't think I will see a Studebaker fighting against Alfa Romeos and big Jaguars in the same category either. Bumpers were lost, old engines got pushed to their very limit, and it was all worth it. The fact that I have only five useable shots of these rapid Lotuses, Brabhams, Lolas and the rest means I missed most of the action. What a shame. Still, there's always next year! It's a privilege to see pre-war Bugattis, and you can get lost in their mechanical perfection for hours standing still in a museum or a car show. But you don't have time for that when about thirty of them are racing flat out on a track. It doesn't happen often. Didn't in the last eighty years at least. This was one of those rare occasions, the first in fact, and the sound is something I'll never forget. A symphony of naturally aspirated and supercharged inline fours and eights of the highest order. 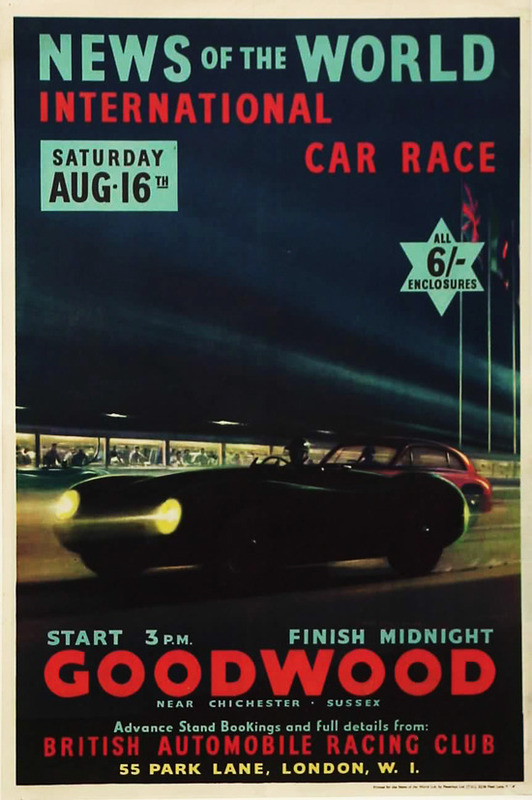 This is a poster of the Goodwood race of 1952. History just got better. Nothing can prepare your ears to the sound of Can-Am McLarens and Le Mans Fords in race mode. They have chimneys for exhausts as standard. But what was even more exciting to see is how the teams worked overnight to get the cars ready for the next day. The red GT40 was running a little rich. By the time I got back to the pits, it was taken to pieces. No time wasted at all, because racecar. Cigars on wheels with drum brakes stopping the power of V12s. Would I dare to throw them around corners like their drivers did? Not in this life. The smell of it is what gets to you. A combination of vintage rubber and wasted fuel, with a bit of oil and grease on the side. We call it proper motorsport. Having two F40s as pace cars meant that the low-drag Le Mans racers could do their demonstration laps at very high speeds. No racing of course as the insurance didn't allow it, but as close as it gets. Another unbelievable twenty minutes both days. I read Senna, Prost, Lauda...and boooooooom, they were gone! And what a boom that was. There's something about the moment when both the supercharger and the turbo spools up in a Group B Lancia and all four wheels leave long black stripes on the starting grid as the whole bunch sprints down the track towards victory. Maybe it's the air in Goodwood.